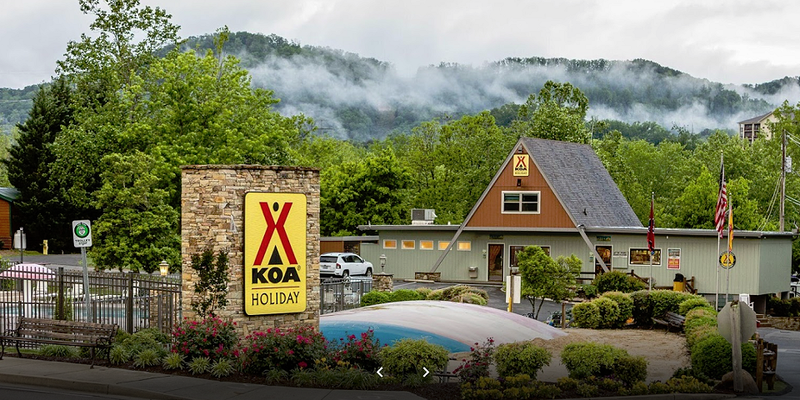 We stayed at Gatlinburg/Pigeon Forge KOA on site 159. It was small and close. They had OK WiFi and cable TV if you have a cable. The site had an asphalt pad and concrete picnic patio. It looked level but it isn’t. It was a full bubble off both N/S and E/W, and I see lots of campers with leveling blocks. The campground has very nice clean bathrooms, ours is about a 20 second walk and has private showers. There were lots of things for kids to do. The laundry facilities are nice, $2.00 per wash, dry was $2.75. They also have free dog wash. The campground is in a great location for shuttle to Gaitlinburg and around Pigeon Forge. Trollies beat driving but expect to wait. They can’t promise times because of the traffic. Our shortest wait was out of Patriot Park (walking distance from KOA) as they had more running. The depot by the black locomotive only had 1 running which means at least 1 hour between trains. It’s only .50 cents each time you board. Both pickup spots within walking distance (black train deport about 15 min walk). This is a campground I consider you stay at because of the destination; it’s not a woodsy, fire at night, campground. You cannot pick your site, you can only reserve the type/size. There were much nicer spots for the same price, but they put us on a small site because we are a truck camper – 26′. We are a retired couple 59 & 61 years old. It is our goal to camp in the lower 48 states (as of October 2018 on 2 states left to go!). We travel via camping to all inclusive resorts, USA and international. We don't need fancy, just accommodating, respectful and clean.